Building a rustic outhouse took some planning; where to build it? It should be private, and out of the way. There should be an easy route to get to it from various buildings on the site, and it's got to have some way of keeping the toilet paper out of the reach of squirrels. The Biffy is nestled in a little patch of woodland, with privacy from cedar trees of various ages, as well as many other native species. The soil is almost pure sand, so it's easy digging, and it's about equal distance from the Mercantile and Pearls Place and the Greenhouse. 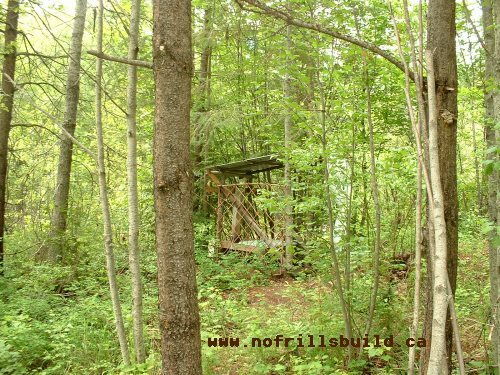 Thank goodness we had it; things could have got pretty ugly without having access to simple bathroom facilities while building our little cottage. The toilet paper is protected in a recycled flour canister - otherwise the squirrels think it's great to line their nest with. A bucket of leaves, sawdust or peat moss to sprinkle every time you use it keeps the smell at a manageable level, and the addition of some dolomite lime every now and then helps too. 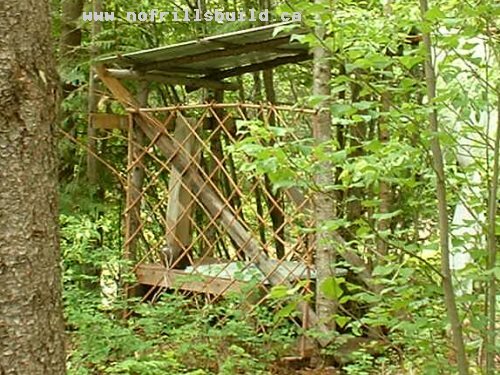 Open air, with twigs for a screen, this is simplicity at it's finest.